When people think about rhinos, they likely think of Africa, where black and white rhinoceroses roam the grasslands and savannas. However, Asia is also home to three distinct species of rhinos: Javan, Sumatran and Indian or greater one-horned rhinos. As conservationists around the world mark World Rhino Day, each of these three species faces its own unique challenges. The Indian or greater one-horned rhino (rhinoceros unicornis) once ranged from Pakistan to Burma. Today, they are concentrated in a few nature reserves in Southern Nepal and the Indian states of Assam, West Bengal and Uttar Pradesh. The bulk of the population lives in Assam’s Kaziranga National Park. Greater one-horned rhinoceros. Photo by Rhett A. Butler. The population of greater one-horned rhinos stands at around 3,500 — smaller than either African species. That number is rising, though, and it represents a remarkable turnaround from 100 years ago. “They are coming back from 100-200 at the beginning of the 20th century,” explains CeCe Sieffert, deputy director of the International Rhino Foundation (IRF). In 2008, the IUCN downlisted the Indian rhino’s status from endangered to vulnerable. “It’s one of our biggest large animal success stories in Asia,” says Nilanga Jayasinghe a program officer for species conservation at the WWF. Conservation programs in Kaziranga park have gone so well that efforts are now starting to focus on moving rhinos elsewhere to establish a second viable population in India. “They are all in one basket and we need to distribute the eggs,” explains Sieffert. Jayasinghe and Sieffert credit the Indian and Nepalese governments with much of the program’s success. Government and non-governmental conservation efforts are well coordinated, and anti-poaching efforts are robust, they say. Nepal, in particular, has made great strides in tackling poaching. Earlier this month, a rhino died after being shot by poachers outside a protected area, but prior to that Nepal had gone more than two years without a documented poaching death. Rhino horn is made of keratin, the same material as human fingernails, but can reportedly fetch in excess of $60,000 per kilogram on the black market, luring in well armed networks of wildlife poachers. Despite the presence of armed patrols poaching numbers in India have shot up. The IUCN estimates that between 2011 and 2015, poachers killed about 121 to 125 rhinos in Assam. The rhino also faces threats from human encroachment on its habitat. The borders of Kaziranga National Park are currently the site of an intense struggle after Assam’s high court ordered the eviction of around 300 families living in the park’s buffer zone. On Sept. 20, two people were killed and 20 injured in clashes between anti-eviction protestors and the police. 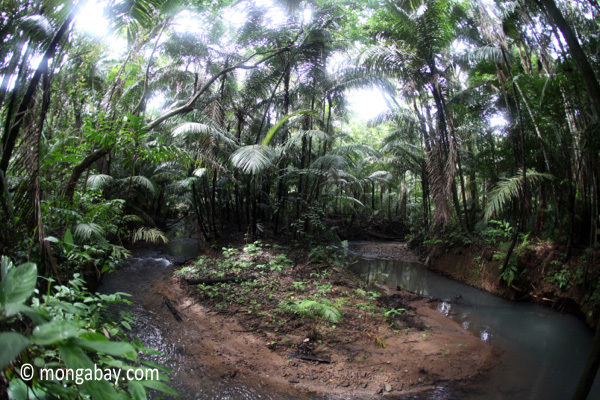 Rainforest in Ujung Kulon National Park. Photo by Rhett A. Butler. 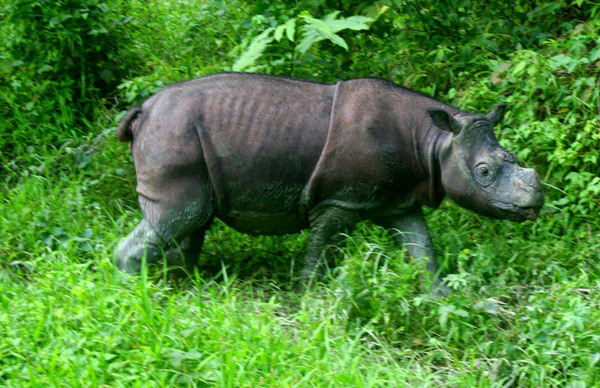 The Javan rhino (Rhinoceros sondaicus sondaicus), faces similar threats of habitat loss and poaching, but is doing so with a much smaller population base. The Javan rhino is listed as critically endangered by the IUCN; its entire known wild population amounts to around 65 individuals, all residing in a single park in Indonesia. With careful stewardship, the population is viable, conservationists say. However, it remains vulnerable on several fronts. With the entire species concentrated in a single location — Ujung Kulon National Park at the western tip of Java — disease or natural disaster could wipe out the entire population. Given Ujung Kulon’s location across a narrow strait from Krakatau (Krakatoa) volcano, the prospect of a natural disaster isn’t just an abstract threat. In 1883, Krakatau erupted, killing some 40,000 people and devastating the park. The second generation of the mighty volcano, known as Anak Krakatau, remains active on the same spot. Despite their remote location, Javan rhinos also face threats from humans. “People keep trying to poach not only rhino, but also other wildlife,” says Widodo Ramono executive director of the Indonesia Rhino Foundation (YABI). “There are quite a lot of people that are always trying to get something from the forest.” YABI runs four rhino protection units in the park, each a team of four who stays in the forest at least 15 days per month. They have found no evidence of rhino poaching in Indonesia since 2006, Ramono says, but the continued presence of hunters in the forest means they cannot afford to relax vigilance. The Javan rhino’s habitat in Ujung Kulon is also threatened by an invasive species, the arenga palm (Arenga obtusifolia), locally known as langkap, which is choking out the native vegetation rhinos need to survive. 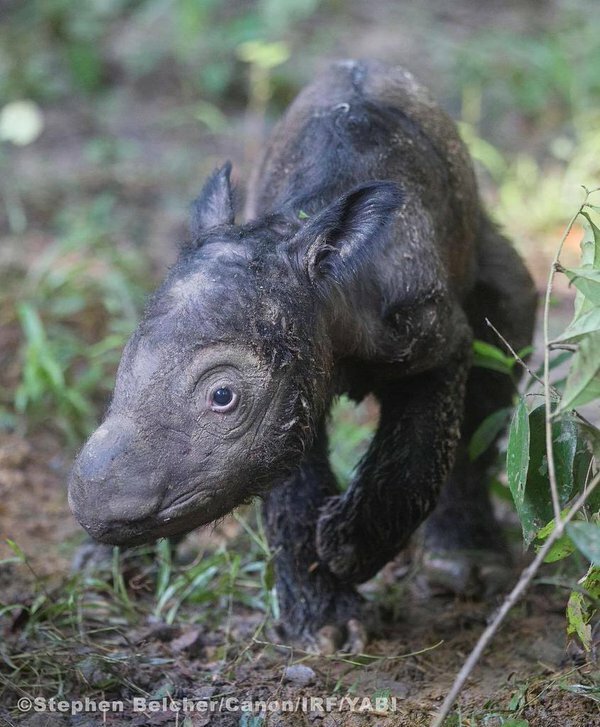 Ramono’s foundation is pinning its hopes on what’s known as the Javan Rhino Study and Conservation Area, 5,000 hectares of forest adjacent to the park. The area is patrolled by rhino protection units, and arenga palms are being cut in hopes of enticing rhinos in with ample supply of the native plants rhinos eat. Ramono says things are going well so far. “We have seen signs of three rhinos visiting the area. We hope they will stay,” he says. In addition to creating room for expansion for the Ulung Kulon rhinos, conservationists hope the site will eventually serve as a staging area from which some Javan rhinos can be moved to a second suitable site. Eventually, the goal is to create two viable populations, ensuring the entire species can’t be wiped out in a single disaster or epidemic. “The issue there is to find a second location for rhinos,” Seiffert says of Java. A captive Bornean rhino (Dicerorhinus sumatrensis harrissoni) named Tam in Sabah, Malaysia. Photo by Jeremy Hance. Most threatened of all are the hairy, two-horned Sumatran rhino (Dicerorhinus sumatrensis), the last surviving representatives of the genus Dicerorhinus. John Payne, executive director of the Borneo Rhino Alliance (BORA), puts chances of the species’ survival at around 50/50. “Some people think it’s a hopeless case,” he adds. A few Sumatran rhinos live in captivity — seven in Indonesia and three in Malaysia. Some estimates place the wild population in Indonesia as high as 100, but Payne believes there are likely no more than 55 between the Indonesian islands of Kalimantan and Sumatra; last year, Malaysian officials admitted the country no longer has any surviving wild rhinos. With a dwindling population and limited resources, exactly how to achieve this goal of “more babies” is the subject of impassioned debate. Some groups, like Payne’s, believe resources should be channeled to high-tech assisted fertility efforts. Such interventions may prove necessary because many of the surviving rhinos are prone to fertility problems. Only one of the captive females in Indonesia and Malaysia has been able breed naturally. Others favor more moderate efforts to ensure wild rhinos have the chance to mate with each other in their natural habitat, or to support natural breeding in large semi-wild enclosures. 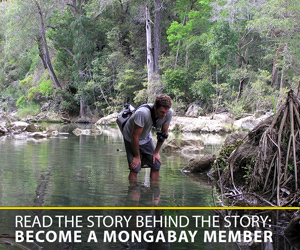 “Our goal is to ensure that species are protected in the wild. But we don’t have anything against zoos as long as they are accredited,” says Jayasinghe of the WWF. After years of disappointment, captive breeding programs in Indonesia have enjoyed some success. 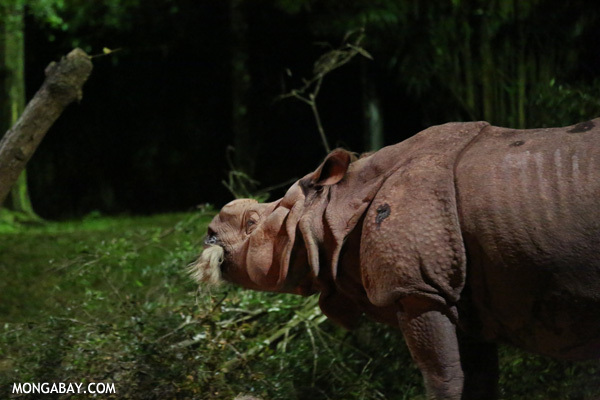 Andatu, a healthy male rhino, was born at the Sumatran Rhino Sanctuary in 2012. His mother, Ratu, is a wild rhino that was captured and brought to the sanctuary. His father Andalas was born in captivity in Cincinnati. A second, female, calf was born to the pair in May. These births are encouraging, but not enough to stem the decline in population. Despite disagreements about the exact way to proceed, conservationists are in accord about the fact that isolated Sumatran rhinos must be brought together if they are to survive. After talks between YABI and Indonesia’s Directorate General of Forest Protection and Nature Conservation, Ramono says an agreement has been reached to transport and consolidate groups of less than five Sumatran rhinos into larger populations — all that’s missing are the funds, which he hopes will come via European and North American government conservation programs. “If the money is available, we can do it as soon as possible,” he says.